The Shelf of Shame. In each installment, one of our FilmNerds contributors will reveal five indisputable classic titles that for some inexplicable reason they have not yet seen. In an attempt to earn back the respect of their fellow FilmNerds, each contributor will then set out to see all five of these films some time in the next six months (we felt that was a fair interval, even for the busiest of nerds) at which point we’ll check in with them to see how they did. Let me preface by saying I’ve chosen to avoid the coward’s route and admit that I haven’t seen these films — and let’s make this clear — FROM BEGINNING TO END IN ONE SITTING. Have I seen bits and pieces of each of these movies? Yes, but just because I caught some or most of them either on cable, VHS or DVD doesn’t mean I’ve seen them, and I refuse to claim that I have. Beyond that, I have no excuse. Just didn’t get around to it. Some will seem egregiously omitted, but it’s not for lack of trying. These are omissions I personally consider shameful because they’re all films I’ve always wanted to see but just haven’t. So here goes. Be gentle. Nobody feels worse about this than I do. While I don’t particularly love the musical genre, I certainly do not hate it. Honestly, I just don’t like the Broadway format, which I feel has unfortunately informed the way most studios generate modern musicals. But Stanley Donen and Gene Kelly’s consensus classic is what movies are all about, losing one’s self to the bliss of unparalleled song, dance, comedy and romance. Kelly’s a guy whose filmography has totally escaped me throughout the years, so I owe it the time. So I think I’ll start with what mean believe is not only the finest musical ever made but one of the greatest American films produced. Running times don’t scare me. 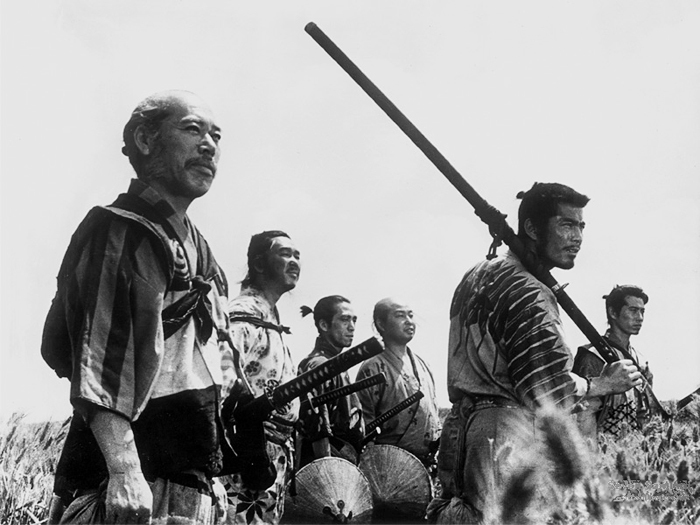 I love Akira Kurosawa as much as the next film snob, and I dig samurai movies like one probably shouldn’t. But how have I been able to appreciate any of those samurai movies I’ve seen without seeing more than two minutes of Kurosawa’s epic. Fantastic premise, director, cast and scale aren’t the things that have deterred me from this surefire classic. So what is it? If I knew, we wouldn’t be in this pickle here, would we? Like Kelly, I haven’t seen enough Kurosawa to consider myself a legitimate fan and appreciator of his work even when I have great access to it. So let’s start here. Something tells me this one hurts my fellow Film Nerds more than the others (actually, probably not), but the biggest slap in the face I could give this movie isn’t that I haven’t seen it. It’s that I’ve owned it on DVD for nearly six years and haven’t made it past the first 20 minutes. Out of this detestably shameful list, this is the one I want to see the most, as the subject matter and parties involved are all right up my alley. This kind of movie appeals to my own sensibilities even more than something like “The Godfather.” Alas, it just wasn’t meant to be all those years. Forgive me, Stanley Kubrick. None of us are worthy, but especially me for this crime. Another one I happen to own, but not until recently. Ahem, that is, not until a couple of years ago. So yes I’ve owned it for two years and haven’t even had the decency to pop it in once. Also another case of seeing bits and pieces throughout the years and loving every last drop of it all, especially anything George C. Scott says or does in it. The saddest thing about this entire list is that every title here, perhaps aside from the first, is something I’d normally see the split-second it released in a theater, and I’d drive to whatever town I needed to if it didn’t play in mine. But accessibility has ruined some of us. Does the lack of the hunt cheapen the experience? Something tells me that in Dr. Strangelove’s case, um, no. As a longtime Steven Spielberg freak, I wish I had even a bad excuse for this one. I know. I know. OK? I KNOW. But sometimes I feel like I’m cursed with this movie. I’ve seen plenty of it to lie, like so many of you know you do, and insist I’ve seen the whole thing. But I’ll be a man here and admit it’s never gone from credits to credits in one spin. In terms of the curse, my problem has always been that whenever I turn this movie on, without fault I might add, I fall asleep during the first half-hour. I cannot explain it. Surely it isn’t because this thing is boring. Do you think I like not having seen what some consider Spielberg’s greatest contribution to this precious medium? Even he says he wants to be remembered for it along with “Schindler’s List.” Maybe it’s a chemical response, I don’t know. Something doesn’t align right with my brain at a certain point in the movie, even if it’s just a millisecond. All I know is it’ll happen one day, hopefully within the next six months. I’ve likely blown my opportunity to experience it like I did all of his other films we marveled at as children and continue to now. I’m now cursed with watching “E.T.” with a more critical eye and with a knowledge that it’s taken this long in the first place. But I hope all of that context disappears when it’s just me and this film, at a showdown I’m pleased to forfeit.